This fuss-free and thrifty tart is a doddle to prepare and uses ingredients from the freezer. Defrost the fish and pastry overnight for a speedy after-work supper. Each serving provides 752kcal, 33g protein, 55g carbohydrate (of which 3g sugars), 43g fat (of which 14g saturates), 3.5g fibre and 1g salt. 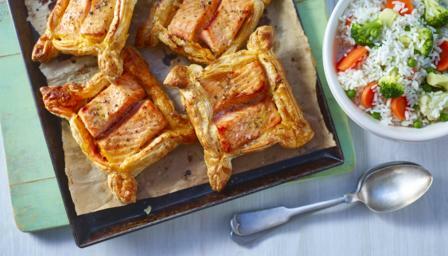 Take the puff pastry and salmon out of the freezer and thaw for 2 hours at room temperature, or overnight in the fridge. When the pastry and salmon have thawed, preheat the oven to 220C/200C Fan/Gas 7 and place a baking tray inside the oven as it heats. Unwrap and unroll the pastry onto a clean, lightly floured work surface. Cut it into four equal-sized rectangles. Place 1 heaped teaspoon of the pesto into the centre of each rectangle. Cut each salmon fillet in half widthways and place two halves, side by side, in the centre of each pastry rectangle, on top of the pesto. Brush the edges of each pastry rectangle with the milk, then fold the edges over themselves to create open parcels, pinching the corners to seal. Brush the exposed pastry with a little more milk. Squeeze a little lemon juice over each piece of salmon, and season, to taste, with freshly ground black pepper. Remove the baking tray from the oven and place it onto a heatproof surface. Arrange the salmon-and-pesto parcels onto the tray, then bake them in the oven for 20-25 minutes, or until the pastry has risen and is golden-brown, and the salmon is cooked through. For the vegetable rice, 5 minutes before the salmon-and-pesto parcels finish cooking, defrost the rice in the microwave until piping hot throughout. Meanwhile, cook the vegetables in a saucepan of boiling water for 2-3 minutes, or until piping hot throughout. Drain in a colander, then mix with the rice. To serve, divide the vegetable rice equally among four warmed serving plates, then place one salmon-and-pesto parcel on top of each portion. Garnish with the basil leaves, if using.